Welcome to another DeNami Color Challenge! This weeks gorgeous color palette was chosen by Andrea! I am going to have to admit, this one was a challenge for me! But that is what it is all about right? Here is the color combo! I hope that you can join us and play along!! Check out the DeNami blog for more details and to check out the other DT girls and their FAB creations! Those 3 little owls are a hoot! :) Great job with the colours. HUMMMM does not look like it was a problem at all~~ too cute with those owls on the branch ...... hope B has adjusted to the time and you are getting your beauty rest!!! This is adorable. I really love that pruple behind the blue sky...looks amazing. Such a cute card Laurie! LOVE those little owls, you did a great job with those colors! Awesome job with the colors. 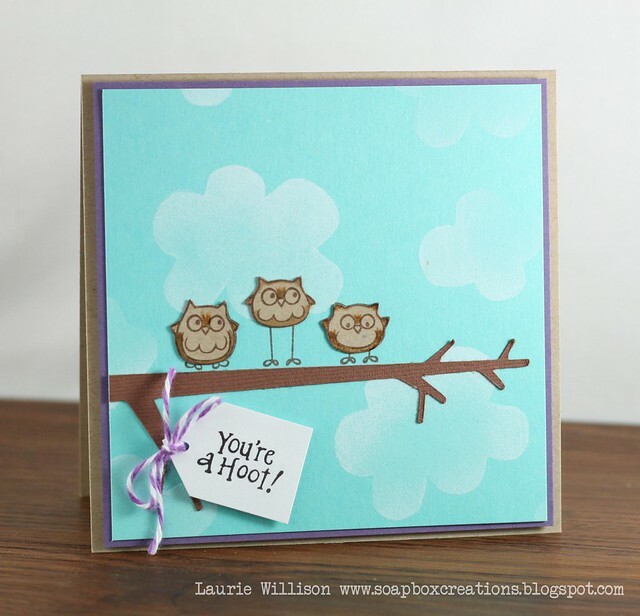 Love the sweet little saying, and the branch is perfect for the owls to sit on. Cute, Cute! SWEET card, Laurie!! Love these CUTE owls! Super cute! Love those sweet owls! You did a great job with the challenge and those different sized owls are really precious! Well, I see no problems with these colors here. Just the right amount! Love those little owls on that branch! Those owls are just the cutest!! Great way to incorporate purple into the card too! Well, you would never guess you had any challenges with this color combo! This is STUNNING Laurie! Thos owls are too darn cute and I LOVE how they're sitting on the branch! Perfect use of the colors friend!